Did that brief synopsis feel like I was dancing around a whole heap of spoilers? Yeah? OK, no more of that. I’m giving everything away in this film. Spoilers will be spoiled. Endings will be revealed. 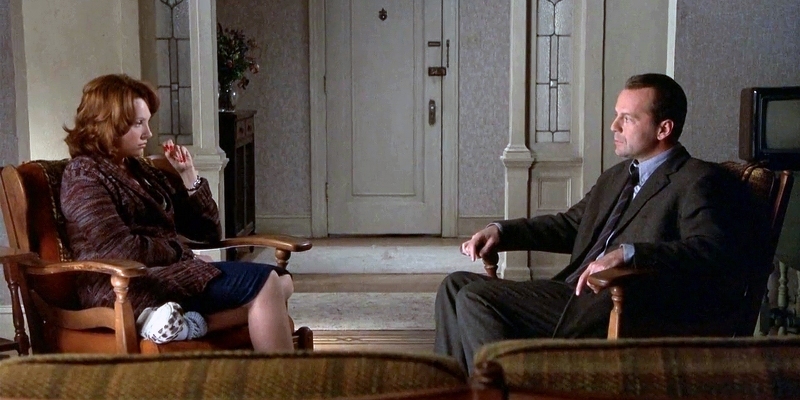 No-one will care, because everyone by now knows what goes down in The Sixth Sense. It’s amongst the epitomes of culturally-significant spoiler movies, along with The Empire Strikes Back and Fight Club (the latter of which I’ll be covering soon), and I went into all of them first time around knowing the big twists, and they didn’t detract from my enjoyment a great deal. So, Cole can see dead people, Malcolm is one such dead person, he didn’t know he was dead and as such the plot doesn’t work. It’s no great revelation to suggest that, if you know the twist and care to scrutinise the story beyond what’s required, there’s a lot of holes. For example, Malcolm is unaware that he is dead, but has been for some time (the title card jump after he is shot reads “The Next Fall”, which suggests at least a few months, if not a year), during which not one single person has ever spoken to or interacted with him in some way? No-one has even glanced in his direction and he considers that normal behaviour? Bear in mind he also lives with his wife (Olivia Williams), who similarly has never spoken to him for the whole time. Imagine someone is shot, recovers in hospital and returns home. Would it be considered an odd reaction for that person’s significant other to not even acknowledge their continued existence? Almost certainly. Did Malcolm witness his own funeral? What did he think was going on? Someone else’s burial? Ignoring the chasm of a plot hole that is this film’s repeat viewing (this was my second viewing of the film, with the first one being about a decade ago), it’s actually really well set up. The evident distance between Malcolm and his wife is insinuated as being a result of their relationship drifting apart after the shooting. She cooks only for herself, he is out working all hours and he often finds her in tears watching their wedding video. It’s actually quite telling of their relationship that the same acts can be seen as a woman both giving up on and mourning the loss of her husband. Also, if anything I was surprised by how long it took to get to the revelation that Cole can see dead people. This was the infamous kid-who-can-see-ghosts movie, even without knowing the climactic twist, yet Cole’s secret is revealed as a mid-film twist, with everything beforehand involving his mother being concerned for her child, and Malcolm dealing with the situation with his wife and the problems of this new kid. I find it odd that the main draw for the film – the fact that Cole can see ghosts – is the subject of build-up and guess-work until about an hour in. Acting-wise all the performances are excellent. This was an early restrained performance from Willis, previously more known for his comedic or action blockbuster turns, but here shows a quieter side. His interactions with the comparably surprising Osment are wonderful. Donnie Wahlberg shines from the supporting cast in a memorably creepy turn as the near-naked former patient who shoots Malcolm, and a young Mischa Barton dribbles vomit in a tent. It’s rarely scary, other than a few jump moments that focus more on a ghost-character turning around to reveal some hideous disfigurement on the back of their head, the tension here comes more from a general creepy feeling, especially when you add elements like Cole’s school being a former location where criminals were hanged. If anything, the score is the scariest part of the whole experience, adding in sudden jumps far greater than those on screen. I watched it alongside my partner, who was busy on her laptop but was listening along, and she jumped more than I did, without the aid of the visuals. 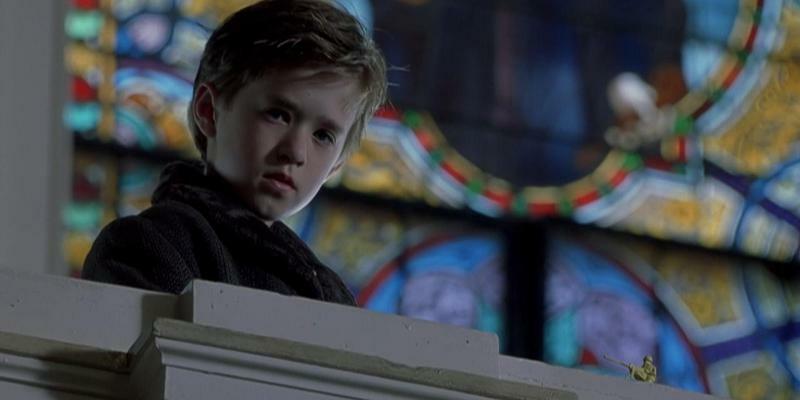 Seriously, Haley Joel Osment is great in The Sixth Sense. He pulls off being a socially outcast kid very well, but not in a stereotypical odd-for-the-sake-of-being-odd kind of way. When he’s talking to Malcolm, he seems almost like every other kid, but his literally haunting secret gets in the way of anyone else socialising with him. And, of course, he can be downright creepy when it’s called for too, and utterly terrified elsewhere. Ignoring some of Shyamalan’s later work, his direction here is pretty damn awesome. I love an early scene, in which Cole’s mother is getting him ready for school. She leaves him in the kitchen as she goes to fetch him a clean tie from the washing machine, and when she returns to the kitchen every drawer and cupboard is now wide open, with Cole still sat innocently at the table. The great thing about the shot is that it’s unbroken, with all these doors having been somehow opened in a very brief amount of time behind the camera that nonchalantly followed Toni Collette. It’s also an effective jump, as it’s wholly unexpected, and something I’ve certainly never seen in a film before. Sadly the overall plot may not hold up to close scrutiny, but if you allow your mind to forego these flaws, what remains is a gripping, tense and altogether different kind of ghost story. It also provides hope for movie lovers in that after death you can still walk around and experience everything, so you can still go and see all those movies that are released after your passing. This is something I’m genuinely concerned about, that some amazing films are going to be released after I die, so I’d like to thank The Sixth Sense for alleviating some fears I have about that. This entry was posted in 08/10, 1001, Choose Film, Empire Top 500, French Toast Sunday, Review, The List and tagged Bruce Willis, Donnie Wahlberg, Haley Joel Osment, M. Night Shyamalan, Mischa Barton, Olivia Williams, The Sixth Sense, Toni Colette by jaycluitt. Bookmark the permalink. I still say this is only the second-best film of this year that has a title starting with “S” and features a kid who sees dead people. Stir of Echoes is a superior movie in all respects. Sad to say, I’ve never even heard of Stir of Echoes. I’ll have to track it down. Kevin Bacon! Yay! Didn’t like it much the first time I saw it because of all the holes in it. I will say it’s at least 10x better than Signs, though. At least M. Night Iamasham made Unbreakable. I really like that one. Unbreakable is my fave of his films too, though I’ve still not seen (and presumable never will) Lady in the Water, The Happening or The Last Airbender. I barely even remember Signs, mainly because I saw Scary Movie 3 first, I think.